Yes we can……… And will. 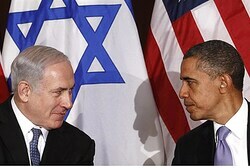 #HeilObama and the rest of the anti-Semites and Israel haters in the administration can go spit up a rope. (AP) — Israeli officials say they won’t warn the U.S. if they decide to launch a pre-emptive strike against Iranian nuclear facilities, according to one U.S. intelligence official familiar with the discussions. The pronouncement, delivered in a series of private, top-level conversations, sets a tense tone ahead of meetings in the coming days at the White House and Capitol Hill. Israeli officials said that if they eventually decide a strike is necessary, they would keep the Americans in the dark to decrease the likelihood that the U.S. would be held responsible for failing to stop Israel’s potential attack. I am now more convinced than ever before, that The Jihadist At 1600™ will order – or at least make the attempt to order – our military to forcibly stop Israel from defending her existence. That being offered, an even more important matter arises: Will the first and other levels down of non-politically-appointed military personnel carry out such an order ? This entry was posted on Monday, February 27th, 2012 at 23:03 and is filed under Main Postings, The Constitutional Watch, The Media, The Second Amendment To The Constitution Of The United States..	You can follow any responses to this entry through the RSS 2.0 feed. You can leave a response, or trackback from your own site. 3 Responses to Yes we can……… And will. Translated it just means that Israel will not tell ‘him’ so he cannot tell his freinds that any action is comming,…. Makes perfect sense to me. Why give *anybody* a warning? It is perhaps a hackneyed phrase, but “A time for choosing” maybe coming. That choosing will be for those patriotic military commanders and those patriotic members of Congress who recognize the danger to America and to the world, let alone Israel, CHOOSE to deal with the situation at 1600 Pennsylvania Avenue in a concerted but wholly constitutional manner.